Recently my wife and I went to the home of some friends for a dinner party involving three couples and numerous pets. Our hosts are fond of animals: They have a big herd of turtles living in a decorative pond outside, and three dogs patrolling inside. Actually, one of the dogs is only slightly more mobile than a shrub; he's around 47,000 years old in dog years and totally blind. He may in fact be medically dead. But dogs don't get all mopey over physical disabilities. This particular dog still maintains a productive routine, which consists of every now and then getting to his feet (this takes about an hour) and wandering around until he bumps into something, which he sniffs. If he thinks it might be food, he tries to eat it; if it bites back, he knows it's one of the other dogs. The two younger dogs are more active; their job is to wait for people to come to the door, then bark loudly and angrily to communicate the fact that, based on their extensive experience as dogs, the people at the door are bad and somebody should bite them. Dogs are deeply suspicious of anybody using a door. Even if, when the door is opened, it turns out that the people standing there know the dogs, and in fact live in the house, the dogs will sometimes continue barking at them for a few seconds, in case it's some kind of trick. Dogs behave this way because they are extremely vigilant (I am using "vigilant'' in the sense of "stupid''). I have some friends named Libby and Buzz who have a small, nervous dog named Elmo who is so vigilant that he would be classified, on the scale of animal intelligence, in the category of "mineral.'' Elmo and Buzz have lived in the same house for several years now, but every time Buzz walks into a room where Elmo is on duty, Elmo reacts as though Buzz is an entire urban street gang, barking, growling and running around in small, alarmed circles to let Libby know that Buzz is bad and she should bite him (she rarely does). After maybe 15 minutes, Elmo starts to remember who Buzz is, and he calms down. But if Buzz leaves the room for, say, 10 seconds, all the current drains out of Elmo's mental battery, and when Buzz returns, YIKES! RED ALERT!, Elmo goes off again, like a small, furry, defective car alarm. It is not a quiet household. But by gosh it is a secure household, thanks to Elmo's vigilance. But getting back to my story: We were having a nice dinner in our friends' home, and during this dinner one of the dogs kept going to a window and growling. We paid no attention, because dogs are always growling -- maybe at the moon, maybe at the turtles, maybe at the Federal Reserve Board -- who can say? After dinner, all of us, including the dogs, went into another room to have dessert and watch the Miami Heat play an important basketball game. Actually, the women watched the game; the men actively controlled the outcome by shouting at the screen. The dogs watched the dessert. Through skillful team shouting, we men won the game, and everybody agreed it had been a pleasant evening. Then the women discovered that their purses, which had been in the kitchen, were gone. While we'd been shouting at the TV, a burglar had sneaked in and stolen them. He'd obviously been watching us through the window. The growling dog had been telling us this. When we discovered the burglary, different people reacted in different ways. Some called the police; others smoked cigarettes, even though they have technically quit. I decided to go outside and look around the yard for Clues. Perhaps I would even find the perpetrator! Then, drawing on my prowess in the martial arts, I would wet my pants. I was called back into the house by my wife, who had been informed by the police dispatcher that, by wandering around out in the dark, I was being really, really vigilant. The police came quickly. Needless to say, the dogs barked at them. (The young dogs, I mean; the dead dog merely checked to see if they were food.) We later concluded that the reason the dogs did NOT bark at the burglar was that (a) they were busy watching the dessert, and (b) the burglar came in through the window, which apparently is not a violation of dog security rules. 2. Dogs will give you a lot of "false alarms,'' but every now and then they may really know what they're barking about. 3. On the other hand, maybe not. 4. 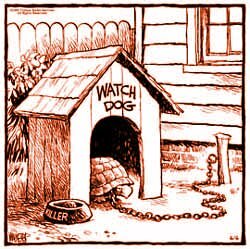 Experts agree that, if you want REAL home security and peace of mind, turtles are worthless.